This beautiful 2014 model Hampton Endurance 640 Enclosed bridge is available now! Her knowledgeable owners have kept her in excellent condition since new. Step aboard this luxurious 2014 64' Hampton Endurance starting with her large covered aft deck with comfortable built in settee, custom chairs for the forward side, large teak table with inlay, day head forward to starboard, port and starboard aft deck controls stations for very easy docking. Enter the salon, a large L-settee is to starboard and barrel chairs to port with entertainment center viewable from all angles. Continuing forward the galley is to starboard and large dinette (California Kitchen) forward of galley facing aft. This fantastic 64' yacht features a three stateroom, two head layout with en suite showers. She has an amidships, full-beam master with walk-in closet, guest cabin to port and VIP stateroom forward with en suite access to guest head. She is extremely well equipped with a full array of Garmin electronics, Hydraulic bow and stern thrusters, and Wesmar stabilizers. RED HERRING offers a spacious layout, beautiful interior decor and state-of-the-art equipment. This spectacular 2014 model Hampton Endurance 640 Skylounge won't last long! RED HERRING is available to see at Marina Bay anytime. Walk onto this gorgeous 64' Hampton to a spacious covered aft deck that features a large settee with inlay teak table and four teak chairs, two control stations to either side, perfectly hidden day head to starboard and port side stairs to the flybridge which features a slide door to seal the aft deck from exposure to rough weather from above. The spacious flybridge is accessed from the stairs on the aft deck or from an internal staircase to port, across from the galley. The flybridge has a lovely L-shaped seating area with table for entertaining, and a full instrumentation helm station with three (3) STIDD helmseats. The aft section of the flybridge has a sunbathing area with two (2) lounge chairs and table with umbrella. Forward of this is the wet bar with sink, grill and fridge. There is a Portuguese bridge prior to the foredeck which has port and starboard settees facing forward. Enter the salon through aft sliding glass doors to find two barrel chairs to port, an L-settee to starboard with another barrel chair aft and a large teak coffee table all in easy viewing of the entertainment center. Continue forward to find the galley starboard with stairs to flybridge across on port side. The galley offers the feel of a real kitchen with its stainless steel appliances and fittings, granite countertops and flooring, along with 3 aft facing bar stools at the breakfast bar. In place of a lower helm forward of the galley, there sits an extra large U-shaped dinette and inlay teak table that easily sits 6 people. This is a great spot for entertaining or enjoying a nice family dinner. Head down the starboard forward curved staircase to find three staterooms, two heads and washer/dryer. The VIP stateroom sits forward and features an island berth and en suite access to guest head and stall shower. A twin guest cabin is to port, just across from the guest head. In the companionway just outside the master stateroom, the washer/dryer is hidden in a large cabinet to starboard. 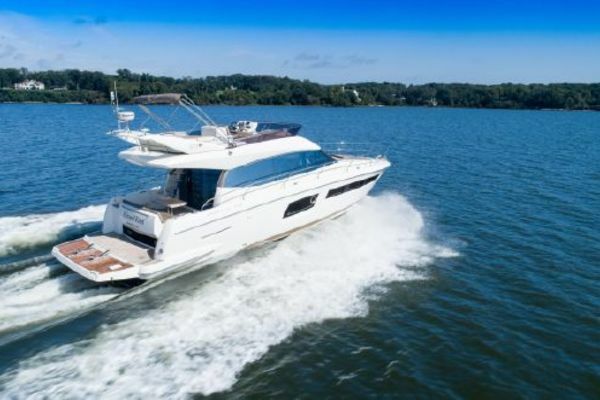 This spacious 64' Hampton features a full-beam master stateroom with king berth, en suite head and shower, plentiful storage, a walk-in closet with hanging lockers and much more! This Hampton Endurance 640 is one of three built and has been kept in immaculate condition since her build. She is truly TURN KEY ready! Generator: (1) KOHLER 23 KW/60 HZ with sound shield. This gorgeous 2014 model Hampton Endurance 640 is available now! Her original owners have kept her in excellent condition! RED HERRING offers a spacious layout, beautiful interior decor and state-of-the-art equipment. This 2014 model Hampton Endurance 640 Skylounge won't last long! RED HERRING is located at Marina Bay and available to see anytime . Please contact me directly for an appointment to see her anytime.